Keen observers of the islands’ natural communities, Hawaiians described twelve zones, or types of natural communities, that spanned the islands from the ocean to the tops of the mountains. The two uppermost of the zones, the kuahiwi (backbone) and the kuamauna (back mountain), are the equivalent of the alpine/aeolian zone on Haleakalā. Kuahiwi is the alpine desert area, generally closest to the summit, where few plants other than lichens and some tufts of grass grow. Here, the predominant form of life is insects. The kuamauna zone begins below the summit and extends into the summit basin. This is the area associated with the ‘āhinahina, the Haleakalā silversword. The silversword was once used in lei-making, and so abundant that visitors described the hillsides as shimmering with the silver color that the Hawaiians named it for. 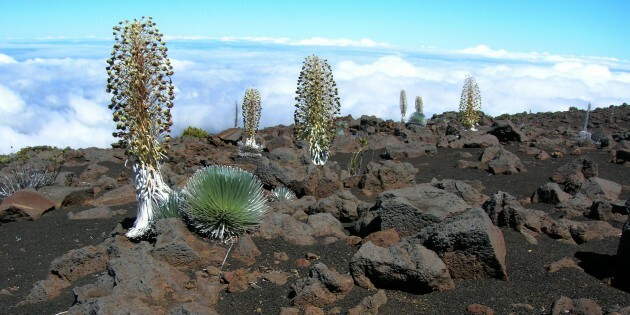 The native species that live in the alpine/aeolian zone of Haleakalā are adapted to its extreme environmental conditions. This unit helps students learn about the main species that live in this zone, how they are adapted to live in this environment, and how they interact with each other. Students learn about plant and animal adaptations to the harsh alpine/aeolian environment through a slide show and a group activity. Students perform an experiment in which they replicate alpine/aeolian environmental conditions and devise structural features that prevent dessication. Students play a game to solidify and demonstrate their knowledge of environmental conditions in the alpine/aeolian ecosystem and how plant and animal life is adapted to these conditions. Students play a game to explore the similarities and relationships among species in the alpine/aeolian zone. 1. How are organisms adapted to live in the alpine/aeolian ecosystem? 2. What are the main species that live in the alpine/aeolian ecosystem? 3. In what ways do organisms that live in the alpine/aeolian ecosystem relate to each other? Native and introduced species, relationships, and adaptations. The small number of plant and insect species native to the alpine/aeolian zone have evolved together into natural communities that are among the least altered of any on Haleakalā. These specialized relationships are threatened by a growing number of introduced species. — Running the lab a second time after students have read about how plants and animals are adapted to the alpine/aeolian conditions. Students can brainstorm other materials to use to protect their sponge insects based on the reading. — Begin the lab with two or more sets of control and experimental sponges. Each set should have a different initial water weight, to simulate how quickly organisms in drought conditions lose water compared to normal moisture conditions. • Have students do additional research on one of the main species in the alpine/aeolian zone. They may present their findings to the class, create a visual or multi-media presentation, or write a report. Carlquist, Sherwin, Hawai’i: A Natural History, 2nd ed., Pacific Tropical Botanical Garden, Lawai, Kaua’i, Hawai’i, 1980. Medeiros, Arthur C. and Lloyd L. Loope, Rare Animals and Plants of Haleakalā National Park, Hawai’i Natural History Association, Hawai’i National Park, 1994, pp. 5-11.